The Huawei MediaPad M1 8.0 is designed with beauty in mind. 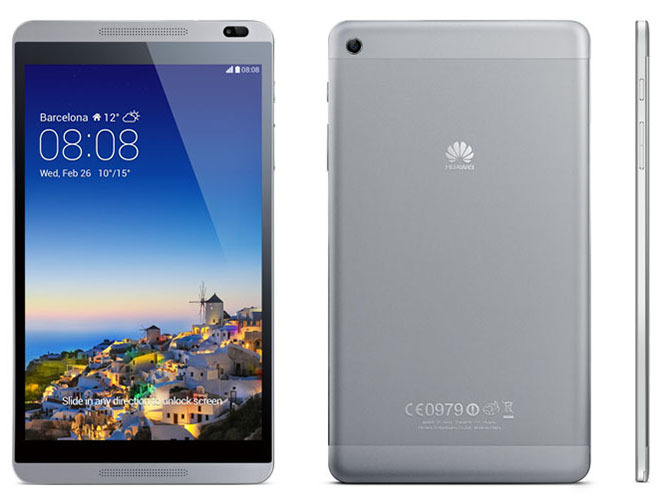 Huawei uses premium materials to ensure the tablet is kept sleek and elegant. An all-aluminium frame gives the device a metallic touch and the clean lines with subtle corner curves help deliver superb feel. The MediaPad M1 8.0 is ultra-slim and ultra-lightweight at just 7.9 mm and around 329 g. There are multiple colors to choose from; white, tulip, carnation, Lily/Lotus and Titanium grey. Display comes in the form of an 8-inch IPS screen with wide viewing angles. Image quality is good with nice colors and contrast. The Android 4.2 Jelly Bean device comes with a Hisilicon Kirin 910 quad core processor clocked at 1.6 GHz, 1 GB RAM and a Mali450-MP4 GPU. The MediaPad M1 8.0 comes with 8 GB on board memory and users can upgrade storage with a microSD card up to and additional 32 GB. There is a 5 mega-pixel autofocus rear camera and a 1 megapixel front facing secondary camera. Other features on the tablet include A-GPS, dual front-facing speakers with good sound quality and dual built-in noise reduction microphones. Battery on the device is a 4800mAh Li-Polymer cell which gives excellent battery life. The MediaPad M1 8.0 is meant for users looking for a large display format tablet which good multimedia capabilities with an affordable price.